The apple harvest area is forecast to be up three percent at 9,700 hectares (ha) in 2018/2019. This increase coupled with normal weather for the growing season should boost apple production to 583,000 metric tons (MT), a 2.6 percent increase over 2017/2018. Total apple production for 2017/2018 is now estimated at 568,000 MT, nine percent higher than 2016/2017; a direct result of the very good production season. 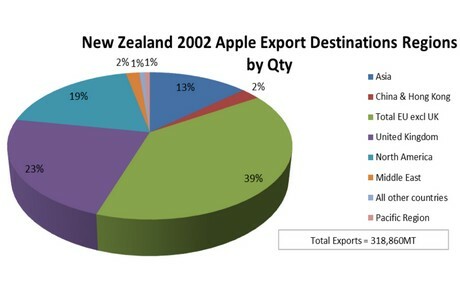 The extra apple production in 2018/2019 is expected to meet demand for domestic consumption at 73,300 MT and supply 120,000 MT of fruit to processing. The main beneficiary of the extra fruit will be exports, which is forecast to rise by four percent increase to 390,000MT. New Zealand exporters expect the Comprehensive and Progressive Agreement for the Trans-Pacific Partnership (CPTPP) to be ratified and entered into force in early 2019. This could mean additional exports to markets like Japan. 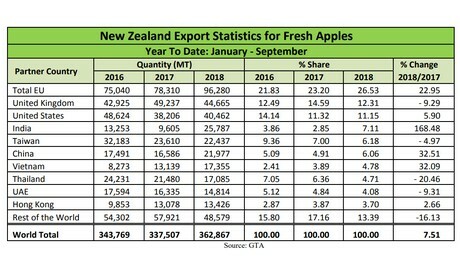 Apple exports for 2017/2018 have been revised up to 375,000 MT, an 8.7 percent increase, primarily because of the increased production. For year-to-date 2017/2018, exports to the E.U. recorded a 23 percent boost as a result of better prices. Pear production for 2018/19 is forecast at 13,000 MT or three percent less than 2017/2018. Hence, pear exports for 2018/19 are reduced to 4,850 MT. For 2017/2018 pear production is estimated at 13,450 MT, which is a 15 percent increase on 2016/2017. Accordingly, pear exports are revised to 5,000 MT, which will be 32 percent higher than 2016/2017. The 2018/2019 planted area is forecast at 10,168 hectares (ha), up 3.5 percent on the estimated 9,825 ha in 2017/2018. The harvested area in 2018/2019 is forecast at 9,700 ha, up 3.2 percent on 2017/2018. Orchard area expansion is trending upwards with an estimated 300-400 ha of new land being planted each year or three to four percent per annum. Industry sources reported that growers are replanting or grafting nearly ten percent of their existing planted area to include more productive and higher value varieties. Around 40 to 50 percent of the planted area now consists of Intellectual Property (IP) protected varieties such as Envy, Dazzle, Rockit or Honeycrisp. Growers planting IP protected varieties pay either a royalty when planting the trees or a volume related IP fee.